I have been reading this one in between reading some others - kept getting distracted! Finally finished it. 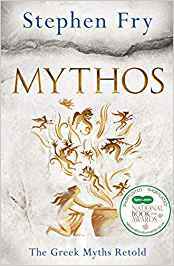 This book follows Greek Mythology from the start of the universe, throught he birth of mankind and beyond. Detailed story of all the gods, and there endless amount of children. Stories retold that we have heard over the years and have come to adore. The book was great. Most people are familiar with at least a few Greek mythology stories (or have studied them in school at one point) - Athena, Prometheus, Zeus....but there are an innumberable number of Gods and their children that it will make your head spin. The stories are grand and funny and tragic all at once. I like how the author pieces together the stories with things we know in today's world (places that still exist - words we use in our every day lanauge) and how they came from Greek mythology. I enjoyed it and I encourage you to try this one. It is a good one to have on your shelf to revisit over and over.